Estimates by various groups of the number of Wiccans in the U.S.
the U.S., during 1999 and 2000. For data before 1999, see the previous essay. Jewelry in the form of one Wiccan pentacle symbol inside another. This web site, ReligiousTolerance.org, conducted a poll of its visitors in late 1999. We were amazed to find that 13% of those answering our poll identified themselves as "Wiccan or other Neopagan." If this were a true sampling of the North American population, then the result would imply that about 40 million Neopagans lived in the U.S. and Canada! Wiccans are probably more actively involved on the Internet than followers of other religions. After all, many Wiccans engage in positive magical activities. Surfing the Internet involves, at a fundamental level, the rearrangement of electrical charges on pieces of silicon buried inside a computer. What could be more magical that that? 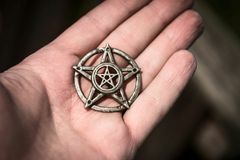 Because of the extremely high level of persecution and oppression of Wiccans, they were probably much more likely than most North Americans to visit our web site, which is devoted to the promotion of religious tolerance and coexistence. Being a member of a religious minority, they would probably be more likely to take part in an anonymous religious poll. Only about 62% of our site visitors live in the U.S. and Canada. Responses from elsewhere in the world would have distorted the results. The Covenant of the Goddess conducted a year-long poll of Witches and Pagans, starting 1999-JUL. They estimated that the total number of Witches and Pagans in the United States is about 768,400. 1% are 60 or over. 86% of Wiccan and Pagan adults were registered to vote. This compared with about 50% among American adults generally. This puts their effective size as a voting block at about 1.3 million, approximately half that of Jews and of Muslims in America at the time. 71% are female; 29% male. They probably have the greatest gender mismatch of any large religion in the U.S. Posting to a Wiccan mailing list which included a personal interview of a B&N executive. Phyllis Curott, "Book of Shadows: A modern woman's journey into the wisdom of Witchcraft and the magic of the Goddess," Broadway Books, (1999) Read reviews or order this book safely from Amazon.com online book store Amazon.com's sales rank for this book was 2,356 on 1999-OCT-26. Not bad, considering that Amazon lists over 1 million books. Site navigation: Home page > World religions > Wicca > Numbers > here"